Many of the dining and parsons chairs we sell can be either contemporary or traditional depending on the fabric you select. However, I think with the exception of the Curved Back Dining Chair, most of our styles are viewed in a more traditional light. One of our overriding goals is to give you choice so that you get furniture that is exactly what you want. We don't want you to have to settle. 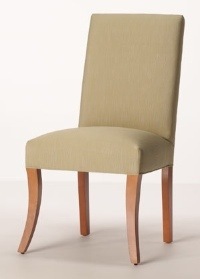 With that in mind we've added the Albany Dining Chair to our line. It features an entirely new curved, tapered leg and a full seat. This combination creates a very clean, minimalist design which is perfect for those looking for a modern dining room chair. Throughout the remainder of the year we plan to offer many more new designs. In the first six months in 2009 we've added more new styles and categories than we did in the entire previous year. We'll be posting everything new on this blog and if there is something in particular you want us to make, we want to hear from you.